I spent a lot of time this semester looking at bees, their hairy thoraxes, shiny translucent wings, and striped dancing abdomens. With their bulging compound eyes, I wondered if they could see multiple images of me, for everywhere I went—even while working on other stories—I seemed to see bees, actual bees and also metaphorical bees. In fact, everything became like bees: cars on the highway didn’t just drive but buzzed passed each other, people in the grocery store foraged for food, and Salt’s identity became clear to me: a beehive. It sort of rolls of the tongue: the Salt Beehive of Documentary Studies. In the photography track, we have certainly felt like worker bees. We have spent hours upon hours working, sometimes staying up all night to document our subjects playing air guitar, writing illegal graffiti, and patrolling the streets with a K-9 in tow. We have run the length of hundreds of soccer fields, swam in icy ocean water, put thousands of miles on our cars, and learned enough about mussels to deserve PhDs. We have pushed the limits of our cameras, seeking any light in the darkest of situations, from graveyards to dance clubs to the swingers’ bedrooms, all to gather the nectar of our craft: images. With the nectar back in the hive, we worked to synthesize it into something coherent, something that will feed us—feed our need for human connection, for meaning, for stories beautiful and complex. Sometimes we brought back so much nectar than the Salt hive couldn’t support it. Our computers panicked and our beekeeper-duo Kate and Scott demanded us to be more confident in culling and editing our work. Though Kate may seem like a queen bee, she is more of our beekeeper. For the queen does not directly control the hive; the queen’s sole function is to serve as the reproducer, laying as many as 2,000 eggs per day! Not Kate’s dream job. Instead, Kate is a watchful beekeeper, who gives her time and advice with a sense of dedication, and honesty. It is true that bees cannot be tamed, and it’s debatable whether or not photography students can be. The best approach to beekeeping and teaching—it seems—is to provide the most conducive environment for success. We thank you, Kate, for your patience with our insecurities, indecision, and stubbornness. We appreciate your commitment to push us to be more thoughtful, considerate, and ethical documentary photographers. I can speak for all of us to say that we are truly blessed to have Scott as part of the teaching duo. His technical knowledge of digital photography, including his superhuman sense of color and his ability to fix printers and archiving fiascos, has astounded us. We thank you, Scott, for your readiness to assist us and for remaining calm despite many challenges. We appreciate your commitment to introduce us to the work of other photographers and to provide us with context to the wider photography world. But all of Salt, not just the photography track, feels like a hive. Honeybee have a natural propensity to work together, and none of the stories we produced could have been as successfully achieved without each other’s feedback and support, given in class critiques, on morning jogs, or over happy hour beers. We thank Salt for its emphasis on collaboration and for valuing multimedia. Now is a hard time for honeybees, as beekeepers all over the U.S. report losses as high as 90%. And it’s a difficult time for the media, as newspapers and magazines close their doors. 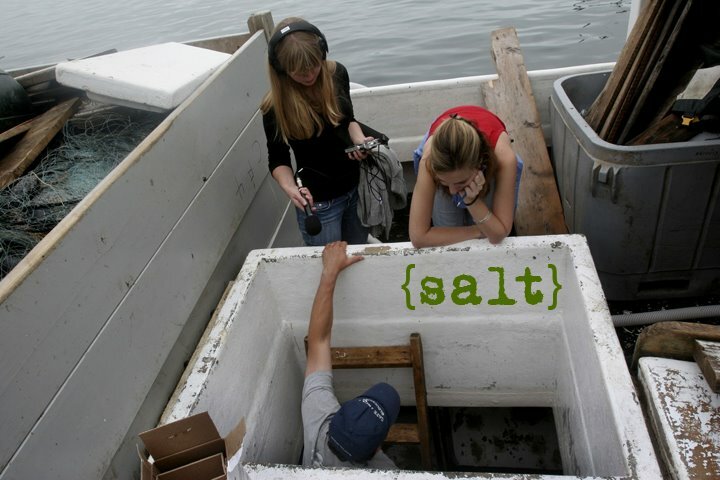 Now is the time for innovation and collaboration, and Salt is providing breeding ground for work and ideas that will sustain storytelling as the platforms and mediums continue to evolve. As I began to write this this morning, Erin, the master beekeeper, called me to tell me a fellow beekeeper on the West end had a hive that had swarmed up into the tree. When a healthy bee hive sees that it is running out of room to store honey, it knows it is time for a large number to leave and seek to build a new hive to store an adequate supply of honey. I had missed the initial drama—the site of thousands of bees swarming out the doorway of their old hive, rising in the air and swirling about like a tornado funnel, making the noise of a railroad train. When I arrived the hive had clustered in a tight ball high up in the tree. The swarm—with the queen safely inside it—was waiting for the scout bees to tell them where to move. This is where the bee metaphor begins to break down. The fact is, we all won’t move together to a new place. We’ll go as far apart from each other as Mexico is from West Africa, as Argentina is from Southeast Asia. But it’s true that the time is prime now to find a new home. We must make way for the next group. For inside the old hive that the swarm has left, a new generation of honeybees will soon emerge from their cells. May Salt continue to provide a conducive creative and supportive space. And may we all continue foraging for stories. right way that will help you in a long line of backlinking scams. of production while ensuring quality and tangible results every month. where people are often fearful of getting too close to strangers. regarding Casey and Haley. This is, of course, especially pertinent given tomorrow's holiday, when love is in the hospital twice. So, they can simply move out of the game.